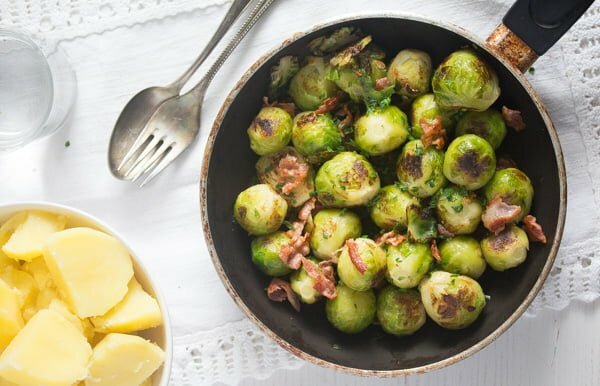 The perfect side dish for Thanksgiving or Christmas (and not only), these Brussels sprouts with garlic and bacon are addictive. This Brussels sprouts with garlic are one of our favorite Brussels sprouts recipes ever. 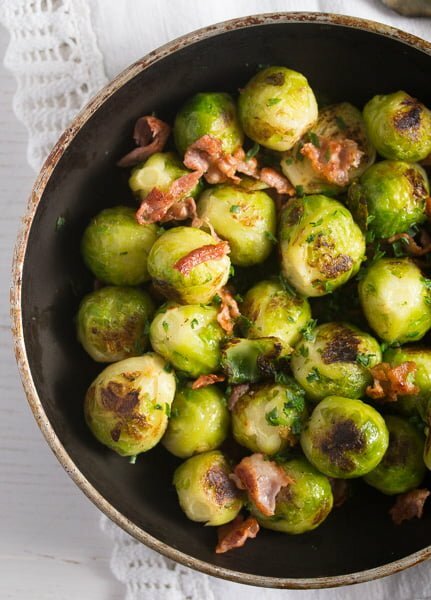 Well, a favorite recipe for my husband and I, my kids are always aghast at the sight of Brussels sprouts, no matter in what kind of dish they are presented. We never had Brussels sprouts in Romania while I was growing up, we only knew them from television, they were a totally exotic vegetable, which only seemed to be mentioned in a negative way, that is: always in some American movies or TV series, where one character or another (mostly kids) was complaining about how disgusting Brussels sprouts are. That didn’t influence us much though, and by us I mean my sister and I. I remember us talking about these mini-cabbage heads and how much we would like to try them. We did love cabbage, everybody does in Romania, and we imagine the Brussels sprouts to taste exactly like that, just in mini format. It was one of the first vegetables I’ve made a purpose on tasting when moving to Germany, where Brussels sprouts are as common as regular cabbage. My first experience with them was not really a good one, I had cooked them to death and I only had some mushy pale things on my plate. 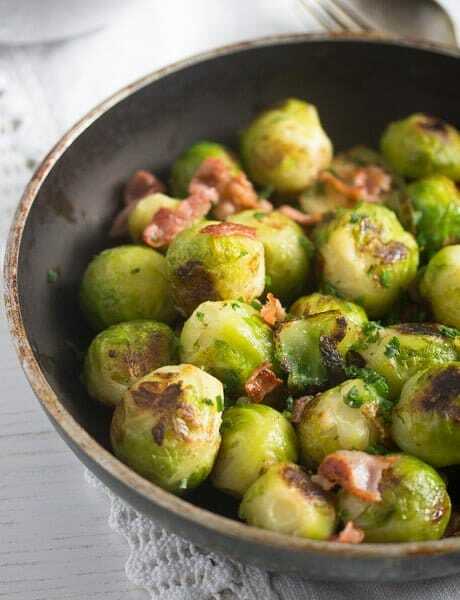 I kept cooking them only in water for a while, taking care to cook them a lot less, so that they would not be so soft anymore, I sometimes made a soup or stew with Brussels sprouts, potatoes and ham, but that was about it. 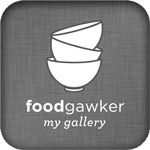 But then I discovered that there are other ways with Brussels sprouts as well, they don’t have to be boring, only cooked in salted water. You can either roast them, which I do so often or you can first cook them slightly and then fry them with garlic and spices. 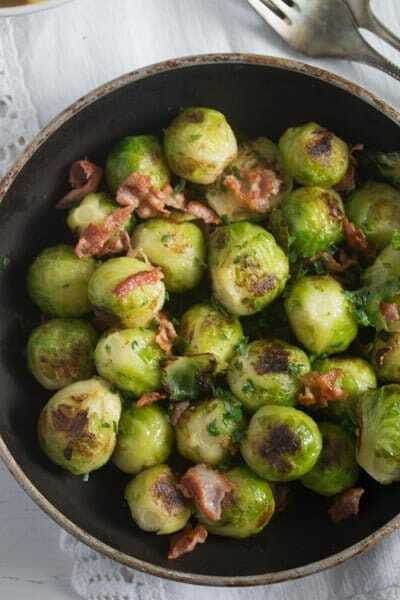 Some bacon on top and there you have it: your new favorite Brussels sprouts side dish. Brussels sprouts are not only a joy to eat, but they are also thoroughly healthy as well. They are rich in vitamins like vitamin C, B6, K, A and also contain dietary fiber, cooper, potassium and magnesium. Their vitamin C content helps boost the immune system, iron absorption, collagen production and the growth and repair of tissues, thus helping the body to recover from illness and injury. Brussels sprouts provide 81% of your daily vitamin C needs in each 78-gram or half a cup cooked sprouts. Their content of vitamin K is also very high, one cup of cooked sprouts containing about 240% of the daily recommended amount of this vitamin. Vitamin K is very important when it comes to blood coagulation, which helps stop bleeding. Vitamin K is also important for the bones, protecting against osteoporosis. 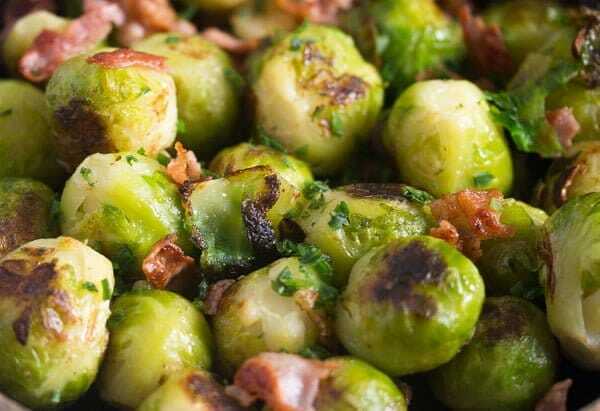 Researchers have found that the consumption of Brussels sprouts might help prevent and possibly reverse blood vessel damage and that Brussels sprouts offer cardiovascular support due to their ability of lowering cholesterol levels. Improve digestion: Brussels sprouts contain a lot of dietary fiber (4 grams per cup) thus helping against constipation. Some other substances contained by the sprouts also help keep our stomach healthy by preventing the overgrow of a bacteria in the stomach. Brussels sprouts contain three important anti-inflammatory components: glucosinolates, vitamin K and omega-3 fatty acids. They all help avoid chronic and excessive inflammation and can help those suffering from arthritis, gout or other inflammatory conditions. The antioxidant content of Brussels sprouts might help reduce oxidative stress caused by free radicals, thus decreasing the risk of cancer. Brussels sprouts might also help maintain blood sugar levels, thus decreasing the risk of diabetes. They contain an acid – alpha-lipoic – which might help insulin work better to lower the blood sugar. Brussels sprouts also seem to have a positive effect on blood pressure, they can regulate hormone levels, can protect the baby during the pregnancy due to their high acid folic content and can help when trying to lose weight. The only word of caution regarding the consumption of Brussels sprouts is related to their vitamin K content. People taking blood-clotting medicine, should speak to their doctors regarding their consumption of vegetables containing such high levels of vitamin K.
Sources: healthline.com, organicfacts.net , whfood.com. Cooking Brussels sprouts in water is probably the most common way of preparing Brussels sprouts. However, the result might be a bit boring if endlessly repeated. So, for this particular Brussels sprouts with garlic recipe I have chosen a slightly different method, that yields much better results. Step 1: Clean the Brussels sprouts. Remove the outer leaves and remove the tip of the stem with the help of small knife. Rinse the sprouts well. If the sprouts are very large, you can halve them. I prefer to buy smaller Brussels sprouts when possible, the taste is the same, but I think they look better when left whole. If cutting them in half, cut them from top to bottom, so that both halves still have a bit of stem at the bottom, that will help the leaves hold together. Step 2: Bring a pot of water to a boil. Add salt. Give the sprouts to the pot, bring to a boil and cook for 7 minutes. Drain well. Step 3: In the meantime fry the bacon in a non-stick pan until crispy. Remove and let drain on kitchen paper, which will help absorb the excess fat. Step 4: Give the very well drained Brussels sprouts to the pan still containing the bacon fat. Fry for 2 minutes, stirring very often, add the sliced garlic cloves and cook for 2 minutes more, stirring continuously to make sure that the garlic doesn’t burn. Step 5: Add the crumbled bacon, season with sea salt and freshly ground black pepper (generously), sprinkle with herbs if desired and serve. 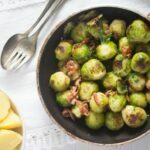 I have served this delicious Brussels sprouts side dish with lots of different roasts, for instance the oven roasted turkey legs or the oven slow-cooked turkey leg. We also had this Brussels sprouts side dish with steaks or pork chops or a good beef roast. And I have also cooked these Brussels sprouts with garlic and bacon as a main dish for dinner with a slice of bread on the side. Bring a pot of water to a boil. Add some salt. Clean the Brussels sprouts by removing their outer leaves. Cut the tip of the stem using a small knife. Rinse the sprouts. Halve the sprouts if they are too large, cutting them from top to bottom, so that each half still has half of the stem, which will help the leaves hold together. Leave the Brussels sprouts whole if they are small. Give the sprouts to the boiling water, bring to a boil again and cook for about 7 minutes. The sprouts should be tender, but still have a good bite. Drain well. In the meantime fry the bacon slices in a non-stick pan. There is no need to add any oil. Remove from the pan on kitchen paper, which will help absorb the excess fat. 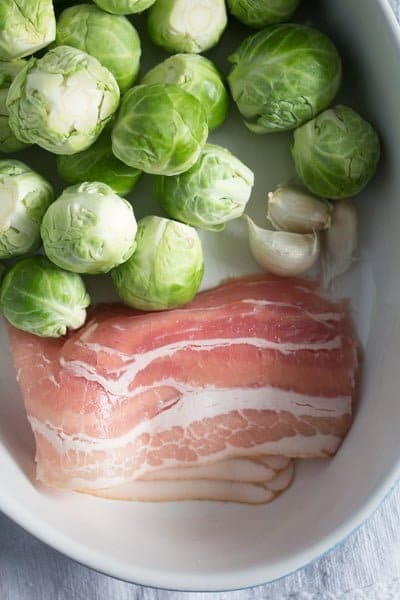 Give the well drained Brussels sprouts to the pan still containing the fat from the bacon. Fry for 2-3 minutes, stirring often. Add the sliced garlic cloves and cook for 2 more minutes, stirring all the time, to avoid that the garlic burns. 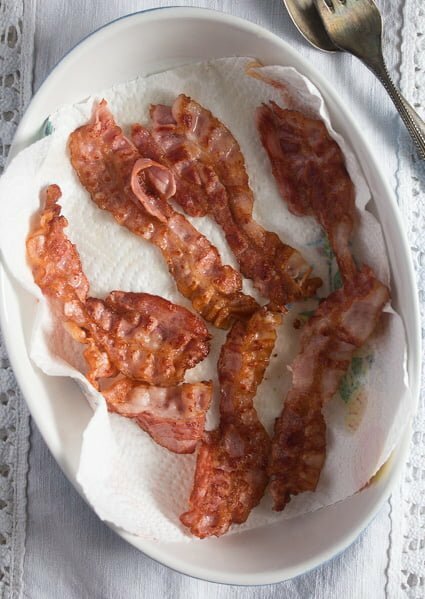 Remove the pan from the heat, add the crumbled bacon and season with salt and freshly ground black pepper. Add the chopped parsley and serve. And what isn’t better with bacon? 🙂 Another so simple and delicious recipe! The family would love this on the Thanksgiving table.